Salliann Putman spent the first thirty years of her life living and working in London. She now lives in Berkshire where she has her studio. She is a member of the Royal Watercolour Society and the New English Art Club. 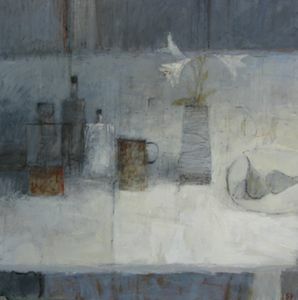 She works in oil, watercolour and mixed media which may include collage. Subject matter in her work is far less important to her than the abstract qualities of the painting itself. She is preoccupied with colour, mark and space and the relationship of these. In the end it is the emotional response to the paint that is all important. She is very aware of the two dimensional surface which expresses shallow depth through layering of paint, mark and other materials. Embedded in her painting is the history of its making. 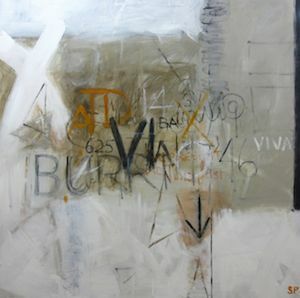 Much of her work begins with a quick drawing in which she attempts to capture what it was that drew her to the subject. But memory and imagination also play their part in the creation of the work. Salliann does not have a preconceived idea of how the finished painting will look. As soon as she makes a mark or places a colour then the painting has its own life and and makes its own demands: she says that it is her concern as a painter to respond to those demands. Salliann exhibits regularly around the UK, mainly in London and the South East, and is represented in the West Country by Hilton Fine Art in Bath. For details of past and upcoming exhibitions, see the about page. The news page will also include information about upcoming exhibitions as well as visits to other’s artists exhibitions and reflections on the art world. Salliann is very interested in art history. As well as painting Salliann runs workshops and courses at various venues, including two courses a year at Dedham Hall in Essex, and one at Bankside Gallery in London. If you have any thoughts or reflections on the art on this website or the content, Salliann would be delighted to hear from you. Please click here to send her a message.